Season the chicken as desired. 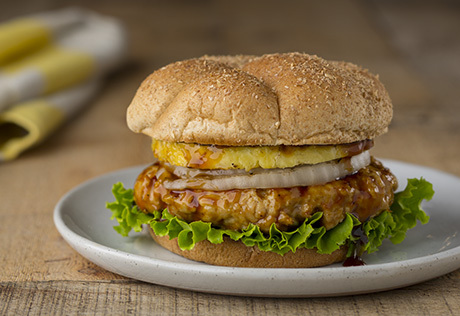 Shape the chicken into 4 (4-to 5-inch diameter) burgers. Reserve half the teriyaki sauce to top the cooked burgers. Spray a grill pan with vegetable cooking spray and heat over medium-high heat for 1 minute. Cook the pineapple for 2 minutes per side or until hot. Remove the pineapple from the pan. Cook the onion for 2 minutes per side or until hot. Remove the onion from the pan. Add the burgers to the pan. Cook for 5 minutes per side or until cooked through, brushing with the remaining teriyaki sauce. To assemble the burgers, layer each as follows: bottom bun half, 1 leaf lettuce, burger, 1 slice onion, 1 slice pineapple, 1 tablespoon reserved teriyaki sauce and top bun half. Serve with additional teriyaki sauce, if desired.